Maggie Roschyk is a name that is quite familiar to fans of Kalmbach's Bead&Button magazine. So what a treat to read through her book, Artistic Seed Bead Jewelry and catch a glimpse of how that amazing mind works. Here's the thing: Maggie wants to turn us all into designers, able to move beyond simply following directions and into designing for ourselves. Learn Maggie's tips for choosing the most wonderful bead colors and finishes, auditioning your beads, and choosing the best stitch for the job at hand. Maggie will give an advanced beginner the confidence to step out and begin designing original beadwork. So Maggie, just where do you get your ideas? This book answers that question! A good deal of attention is paid to the inspiration and creative process for each of the gorgeous 13 projects. These are not beginner projects, but there is a technique review in the back of the book that could make it possible for a highly motivated beginner or advanced beginner to create these pieces. In addition, Maggie shows some smaller variations wherever it's practical, and some of these might be better for less-experienced stitchers. Oh, and there are color variations too, to further tickle your own inner designer. 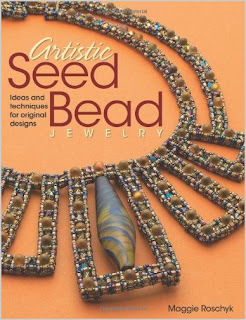 My favorite piece is the African Turquoise Tubes necklace on page 78. I have stitched plenty of brick stitch frames around larger beads, but Maggie has a slightly different method of creating the thread bridge that I really like. A lot!